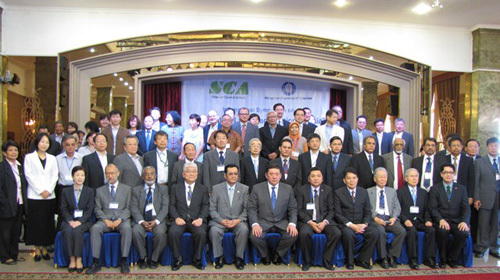 The conference was attended by eleven member countries, namely: Bangladesh (newly obtained the SCA membership during this SCA Conference), China, India, Indonesia, Japan, Republic of Korea, Malaysia, Mongolia, the Philippines, Thailand and Vietnam. During the conference, SCA International Symposium "Combating Land Degradation in Asia" was organized by Mongolian Academy of Sciences (MAS). The symposium was composed of a series of lectures, presentations and discussions addressing the land degradation and desertification issues across the Asia from a wide variety of perspectives. It was attended by a large number of audiences from academia, government and public. Upon commencement, a keynote speech was made by His Excellency Mr. Miyegombo Enkhbold, Deputy Prime Minister of Mongolia, about the land issues with focusing on desertification that Mongolia is now addressing while viewing the issues relating to the land problems which are to be solved with the help of scientific breakthrough. Ichiro Kanazawa, Immediate-past President of Science Council of Japan, then delivered a special message with the gratitude for the generous support that Japan had received from many countries for those suffered from the Great East Japan Earthquake in March in 2011 followed by the report on the course and development of the Fukushima Nuclear Power Plant Accident. The symposium was composed of a number of scientific presentations by experts under the relevant sub-themes including "Policy and Steps by the Mongolian Government to Combat Land Degradation and Desertification", "Current Status and Future Strategies Relating to Desertification and Land Degradation/Land Cover in Asian Countries", "Information, Assessment and Mapping of Land Degradation and Desertification" and "Land Cover Change and Urban Land Planning". A presentation on "Science and Technology Research Partnership for Sustainable Development (SATREPS)" was also delivered by Cindy Yoshiko Shirata, Council Member of Science Council of Japan at Special Information Session. Four SCA Special Sessions, "Open Data and Knowledge Environment for Innovative Research, Education and Society on Environment in Asia (ODKE)", "Monitoring and Prediction for Early Warning against Water-Related Disasters in Asia-Towards Integrated Research", "Pop Culture in Asia: The Landscape of Mongolia - the Formation of Its Prairie Image in East Asia" and "Developing E-Science in Asia", were also organized at Mongolian - Japan Center for Human Resources Development. Furthermore, a courtesy call by the SCA Management Board Members to Mr. Ochirbat Dagvadorj, Member of the State Great Hural (Parliament), Chair of Standing Committee on Social Policy, Education, Culture and Science was arranged.